Steve Andrus is an artist, a sailor and a mountaineer. He has sailed from Maine to the Caribbean, on the Intracoastal Waterway and in the open ocean. He has sailed on pleasure cruises and yacht deliveries, in flat seas to seas 60 feet. Images from these voyages and adventures flood his memory and blend with his experience and knowledge as he captures the sea and boats in watercolor. 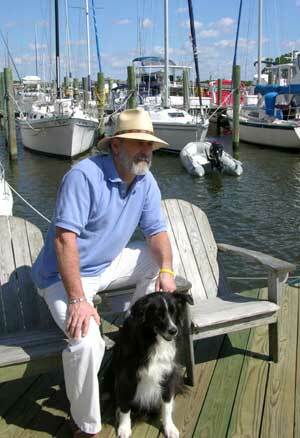 Steve came to the Outer banks in the early 70s and started the art department in Manteo High School/ Middle School. After two years of teaching he opened his own gallery and operated that gallery and then a second gallery for the next 15 years, selling only his original watercolors of boats, harbors, oceans and beaches. He has a Masters of Fine Arts degree and is an artist member of the American Society of Marine Artists. In 1990 Steve’s travels sparked a desire to paint the mountain and high country in and around Taos, New Mexico. He then opened the Andrus gallery and Studio and painted the mountains he lived in. He took to the mountains as he took to the sea, hiking, skiing and eventually becoming a life member of Taos Search and Rescue. But the sea was never far away and in 2002 he moved again, back to the Outer Banks, to friends, family and the sea. His magnificent watercolors of sailing craft, harbors and marine subjects are now in his new gallery in the Waterfront Shops in downtown Manteo. Steve paints his impressions. We all know that if we were to have a thousand people look at a scene and were able to print out what each person saw we would get a thousand views. Steve paints that way, painting his impression of the places that he has been and the scenes that he has seen because he’s not tied down to having to look at the subjects he paints he can concentrate on the composition and design and in putting the feeling of the whole scene in each watercolor. Knowing the subject so well, he can then interpret what he sees in his mind. Stop by and see Steve, his gallery and his work.